Desert Nights Casino :: Crazy Camel Cash slot - PLAY NOW! 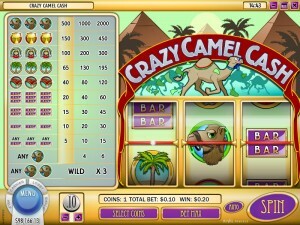 Rival Gaming is proud to announce the launch of Crazy Camel Cash, a brand new 3 Reel Slot. Come with us on a crazy camel ride through the desert! If you spend too long in the desert, you might start to see things that are CrAzY — like a magic flying carpet or a camel which pays out as a scatter, wild AND jackpot! But, no matter what you see, one thing is for sure; where there are camels, there is cash.